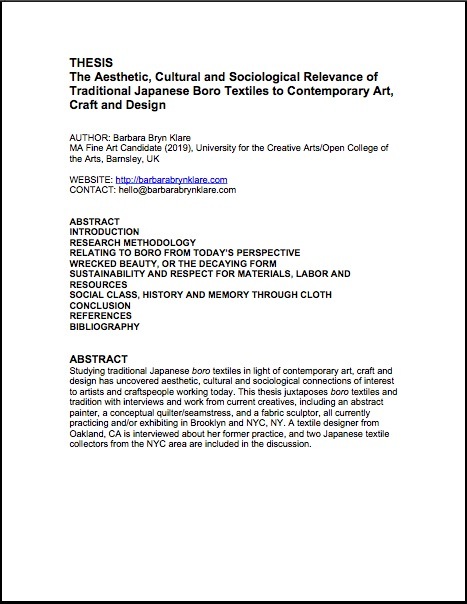 What is the cultural, sociological and aesthetic relevance of traditional Japanese boro textiles to contemporary craft, art and design? A few years ago, I saw my first piece of boro clothing. Frayed, irregular, and patched several times, it was stunning, humbling and inspiring. I also had the opportunity to hear textile expert Yoshiko Wada speak at the Textile Arts Council in San Francisco on the Art of Boro in 2015. Her lecture explained that the term boro, like many Japanese words, has multiple meanings and interpretations. It can describe a specific style of Japanese textile, but at the same time, a way of life and specific and somewhat difficult time in Japanese history, among other things. It could express the psychological “feeling” of something worn down or ragged, and all that that implies. Many Japanese have very emotional reactions to boro. As I studied boro, I began to see that this little-known textile, born of necessity and extreme conditions in nineteenth and early twentieth-century rural Japan, had much to teach me and that its many interpretations had much to say to artists and craftspeople working in today’s complex world. Most artists today are not working under the same harsh conditions and material limitations as the boro practitioners, yet we are all facing the consequences of diminishing resources and destruction in an increasingly smaller world—and the effect this has on our collective and artistic psyches. I have been developing and testing my thesis—that boro has for more to teach us and its values and aesthetics have relevance that can be shown in all kinds of contemporary art—for over two years, through research, hands-on experience, and by gathering feedback on crowd-based platforms/social media sites, including Instagram, Facebook and Pinterest. My Instagram profile (@modernboro) shows examples of different media that I believe show an association with traditional boro used in a modern artistic context. In February 2018, I conducted primary research (interviews, hands-on workshops and studio visits) in NYC with several Japanese textile experts, sustainable fashion practitioners, and contemporary artists incorporating traditional Japanese textiles and values associated with boro in their work. Secondary research included visiting the Tatter Blue Textile Library in Brooklyn for further information. I also purchased a small sample of boro for my own collection. I previously attended classes with local experts on boro textile sewing and assembly techniques and traditional indigo dyeing. These classes give me a practical basis from which to do research. This research was supported by a Craft Research Fund grant from the Center for Craft. I gratefully acknowledge The Craft, Creativity and Design Center for their generous support.